"Rod Stewart is quite simply one of the best selling recording artists of all time in a career spanning five decades. Tonight's the Night, the smash hit West End musical comedy inspired by the songs of Rod is the all-singing, all-dancing feel good show which went on to play sold-out theatres across the UK. Tonight's the Night is back and now is your chance to rediscover the magic of timeless classic songs, from Maggie May to Baby Jane and Hot Legs to Sailing plus many more! 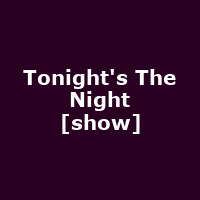 Set on the mean streets of Detroit and in the glamorous clubs of uptown LA, Tonight's the Night tells the story of a shy young man, so tongue-tied that he cannot find the courage to declare his love to the girl of his dreams. How different he is to his hero, that legendary rock 'n' roll vagabond Rod Stewart - now there's a guy who never had any trouble hitting on a girl! One night our hero strikes a deal with the Devil, trading his soul for Rod's. It seems like a good idea at the time but this guy is about to find out the hard way that you can't find true love using another man's moves and that devil or no devil, there's only one Rod Stewart! Written by multi award-winning writer and comedian Ben Elton.